Marilynne Paspaley, of the Paspaley pearls dynasty, is the founder and Managing Director of Pinctada Hotels & Resorts, so her focus has shifted from strings of pearls to a string of hotels. 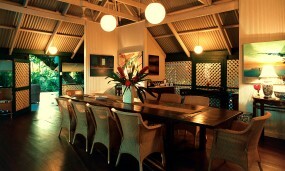 All her hotels are in the Kimberley region of northwest Australia and all are distinctive and individual. 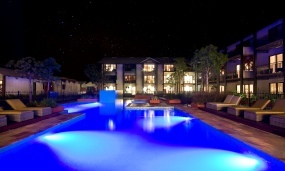 They include: Pinctada Cable Beach, Broome's new award-winning five-star spa resort; McAlpine House, Broome, an intimate boutique escape, Captain Kennedy House, Broome, a century old five bedroom home and The Kimberley Grande, a 72-room homestead style resort at Kununurra, the gateway to the East Kimberley. 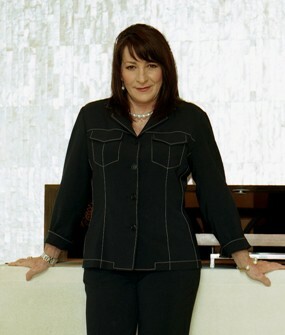 She remains on the board of the Paspaley Group of Companies. What inspired you to create Pinctada Hotels & Resorts? Pinctada Hotels & Resorts combines two of my passions - the Kimberley and customer service. The Kimberley is a world-class destination and I was inspired to create a range of world class experiences that capture and reflect its unique landscape, culture, heritage and spirit - from Broome in the West to Kununurra in the East. My retail background also provided inspiration. During my time in that profession, I found great satisfaction in creating an environment where people felt welcome and cared for, where staff were knowledgeable and professional, and where our service provided people with accurate information that enabled them to make informed decisions. When deciding on this new path, I was excited at the thought of creating a travel experience that captures those same values. What is the single best/defining thing about Pinctada properties? Our personalised service. I get a great thrill when I see guests dozing on the lounges in the BRIZO Pool Bar at Pinctada Cable Beach - or in the gardens of McAlpine House - because I believe the greatest 'luxury' we can offer travellers is an environment where they feel so 'at home' with us, so nurtured and cared for, that they can switch off from life's daily routine and truly relax. While our resorts provide the comfort, our people are the essence of Pinctada. Our staff members are genuine hosts, by profession and by nature, who truly understand personal service. It's about taking note of how you, the customer, is feeling, anticipating your needs, customising experiences to suit your preferences and curiosities and creating an atmosphere where you have a sense of belonging. Often it's the small, thoughtful gestures that leave the biggest impression and I'm delighted our hosts consistently create such memories for our guests. Does creating beautiful jewellery and creating beautiful resorts have anything in common? Yes, both are designed to create memories, to give people an experience they have earned. Respect is something else they have in common - with jewellery it's respecting the gem, with hotels it's paying homage to the history and culture of the destination and recognising and meeting the expectation of the guest. Both also require innovative twists on traditional concepts - and, attention to detail. Detail is key to both - it eliminates frustration. Do you feel a 'spirit of place' affinity with your properties in WA? Totally. Our guests also regularly comment about the intangible qualities of our resorts. A big part of the Kimberley experience is the feeling of destination, space and a connection to the landscape. It's always been important to me that we capture this sense of 'place and space' in our resorts by reflecting the Kimberley's unique landscape, rich heritage and eclectic culture - in the design features, the original art, and the colours and textures of the decor. McAlpine House and Captain Kennedy House are both century-old villas that were once home to a Master Pearler - they have their own unique spirit because a sense of Broome's past lingers here. In time, Pinctada Cable Beach and The Kimberley Grande at Kununurra will also have their own 'spirit of place' - and, like the Kimberley's spirit, it will be created by the people who visit us in search of new and enriching experiences. A new twist on 'caring for the environment' - hotels and resorts that celebrate the natural environment and climate of their destination. So often hotels create their own wonderful world within, but there is no interaction with the world outside - closed windows and a reliance on air conditioning and electric lights are the most common barriers. The design brief for Pinctada Cable Beach was to respect Broome's architectural vernacular and 'bring the outdoors inside'. As such, all our rooms capture natural light and the Indian Ocean breezes. They all feature flow-through ventilation and louvers - including in the bathrooms - so there is always a connection to Broome's wonderful climate and landscape. This not only enables our guests to enjoy the Kimberley destination, but also reduces the need for lighting and air conditioning which complements our other environmental sustainability initiatives in further reducing the spa resort's carbon footprint. My emotional response feeling relaxed and comfortable in the environment, having a sense of privacy combined with the knowledge that there is excellent service whenever I need it, and having no frustrations with the facilities or amenities. Mostly, it's feeling nurtured and cared for by people who understand what I might need or desire - sometimes even before I do! It's the unexpected personal touches that create a luxury experience. When I find this level of service, I unwittingly turn off from the 'day to day' and reconnect - with my husband, my family or simply, myself - and, to me that is the greatest luxury of all. I travel more on business than pleasure, so my favourite hotels/resorts are generally in cities. There are a number in Switzerland such as the Beau Rivage in Geneva, which I love because it is so intimate and charming; the Baur au Lac in Zurich because it has such old world charm and the staff appear to have been there forever; and Suvretta House in St Moritz because the staff really have been there for decades! Also, the Grand Hyatt in Hong Kong which is a superb example of modern comfort and classic luxurious design. In Australia, I like The Richardson in Perth because of its excellent staff, its excellent restaurant and the relaxed comfort of the apartments. Geneva - it is of a size where one can gain a sense of familiarity in a short time and with that comes a sense of being a part of it. I also like the mixture of nationalities that reside there. Out of an 800,000 population a decade ago, only 300,000 were Swiss and the rest were from all over the world. I like that cosmopolitan atmosphere. Yacht Club Costa Smeralda - the food was good but the company was fantastic. It is a long time since I have laughed as much as I did that night. It depends where I am going or coming from. I love getting onto a Qantas flight when coming back from America because to hear the Australian accent of the crew makes me feel I am nearly home already. I really enjoy Emirates when travelling to Europe and Cathay when travelling to Asia. Both Emirates and Cathay truly understand service, comfort and excellence. They do not compromise. And their pricing is reasonable. My computer, one book and my husband whenever possible! Staying at the Tawaraya Ryokan in Kyoto, Japan. This is the oldest continuously running inn in Japan. It is a very old structure and the rooms are absolute simplicity. However, it was the most extraordinary, personal style of service that I have every experienced. The staff appear to be as old as the building and yet they seem to have a sixth sense about what would make you feel good at any moment. I have never felt more welcome or cared for, ever, anywhere! If I can achieve that in my hotels, I will have achieved my dream. The travel itself! The ability to journey to, experience and explore new destinations. New friends, the destinations themselves and the memories from the moments of discovery that one has the good fortune to make.